Now available! How do we get to imagine the music we make? Where and how is it grounded? What is the relationship between the art and its maker, and what and who does music represent? In this publication, these four core notions serve as a set of lenses permitting different perspectives on one another. However much the field of the sounding arts might pretend to be tangential to such affections, they provide important grounds for musical creation. Some twenty artists have created a variety of outputs – as different in form, strategies, approach, and language, as they are rooted in a variety of sub-fields within the sounding arts. With contributions by AGF aka Antye Greie, Andrea Parkins, Aurélie Lierman, Bonnie Jones, Cathy Lane, Electric Indigo aka Susanne Kirchmayr, Felicity Ford, Heimo Lattner, Jaume Ferrete Vázquez, Judith Laub, Julia Eckhardt, Marc Matter, Marijs Boulogne, Marion Wasserbauer, Myriam Van Imschoot, pali meursault, Peter Westenberg, Richard Scott, Romy Rüegger, Susan McClary, Suzanne Thorpe. Julia Eckhardt (Ed.) is a musician and curator in the field of the sounding arts. She is founding member and artistic director of Q-O2 workspace in Brussels. As a viola player, she has been involved in various collaborations with composers and improvisers. She has taught and lectured at art institutes in Leuven and Brussels. 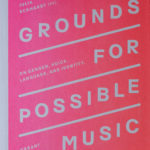 Eckhardt is co-author of The Second Sound, conversations on gender and music, together with Leen De Graeve. Available on Les presses du réel.